Since the beginning of time, man has sought protection through the creation of weapons. Weapons molded and changed the course of history, destroying civilizations and creating new ones. As enemies became more sophisticated, the weapons of choice became more crafty, cruel and deadly. The Macedonians became a great civilization due to the introduction of siege weapons. The Romans capitalized on their creations and crafted war as a strategic art ruled by precision. The Chinese introduced gunpowder in the Middle Ages, which lead to a military strategy of propellent-based ordinances. The art of war and death was screaming forward changing the scope of conquest and World power. The crown jewel which would open the door to the threat of mass slaughter as a form of deterrent and change the tide of war... the atomic bomb. World wars, dictators, rank and file soldiers would rise and fall on the creation of weapons of devastation. So, after all the bombs have been dropped and the ashes have settled the question remains... is there any hope? 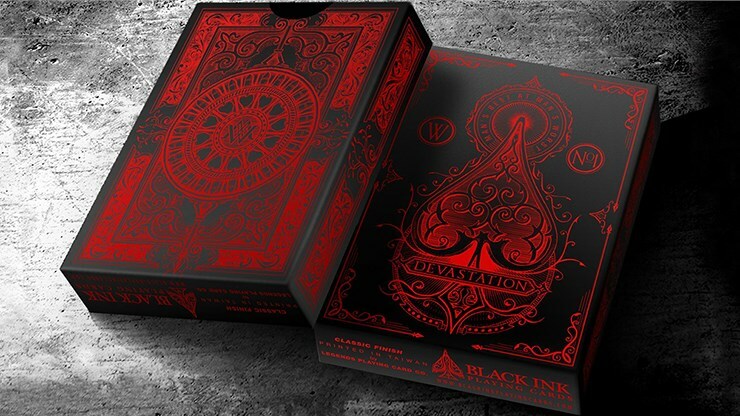 The Standard Edition is the basic deck which has much more than any collector bargains for in a standard edition. Intricate details, beautiful composition and a great theme... this deck is one that you will not want to pass up.